The Beautiful Red Wood Lodge on Deep Creek is a large 3000 square foot mountain cabin which can accommodate from just 2 people all the way up to about 30 people (even more if some folks want to camp out). For small groups of 6-8 or even just 2 people, our rates are based on the number in your group so you will not be charged based on the size of this lodge. 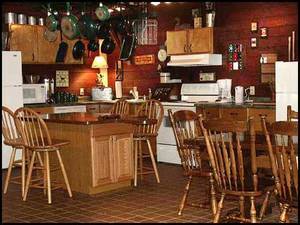 The Lodge at Deep Creek, is a 5 bedroom, 3 bathroom cabin with a 1000 square foot great room. In the great room you will find a real wood, rocked fireplace, and 5 queen size leather futon couches w/sleepers. Off of the kitchen and great room you will find 5 bedrooms. Three of these bedrooms each have one queen size bed, and one of those rooms also has its own rock fireplace with a soothing set of real gas wood logs, operated by remote control. Another of the bedrooms has 2 queen beds and the 5th bedroom has 3 queen beds. This gives a total of 8 queen size beds and 5 queen size sleeper futons. 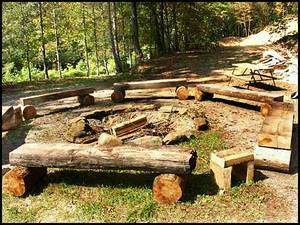 There is also plenty of room (25 private acres) for tent camping and RV hook-ups. Tent camping and RV hookups are only for guests of the Lodge so you will have all 25 acres to yourself. For your enjoyment, As well as the wood-burning fireplace, the cabin also has an outdoor hot tub, a 50 inch TV with satallite, a VCR, DVD, and CD player with 100 watt speakers. 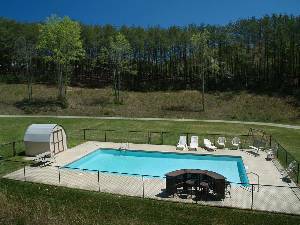 Outside you will also find an area to light campfires, a hand built rocked BBQ grill, hiking trails, horseshoe pits, and oh did I mention you also have your own private 20x40 in-ground swimming pool?? We also have a large jungle gym set for the kids to play on and a great horse pit for all to enjoy. Inside the Lodge you will find a full kitchen with all utensils, 2 refrigerators, a large deep freezer, a coffee machine that can make 50 cups at a time and many oversized pots and pans for cooking those large family meals. We also provide all linens and towels, a telephone, and a washer and dryer. 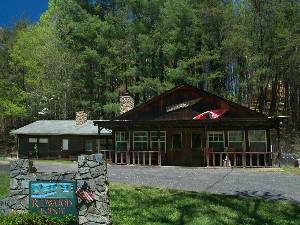 Deep Creek Lodge is situated across the street from Deep Creek and is just one mile to the entrance of the Great Smoky Mountain National Park. 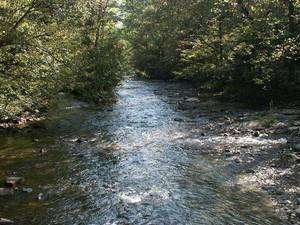 Deep Creek offers numerous activities including; tubing, hiking, trout fishing, horseback ridding, scenic waterfalls, mountain biking, and some breath taking views…. This is truly an outdoor enthusiasts dream come true. But don’t just take my word for it, Bryson City has been voted the “Outdoor Adventure capital of The Great Smoky Mountains“, for 2 years in a row, by “Sports Afield Magazine. As well as being located just one mile to The Great Smoky Mountain National Park, we are only minutes to all the many activities including, White Water Rafting, Hiking, Fishing, Deep Creek, Lake Fontana, Cherokee Indian Reservation, Harah’s Casino, Antique Shops, Great Smoky Mountain Railroad, Rock Mining, And much much more. We are also conveniently located as a home base for all your day trips as we are just an hour drive to Asheville, Gatlinburg, Pigeon Forge, and Maggie Valley. If you have any questions or would like to make a reservation, I can be reached at Call / Email Owner . This 1000 squarefoot great room includes a spacious, fully stocked kitchen, Wood Burning Fire Place, and 5 queen size leather futon sleeper couches. 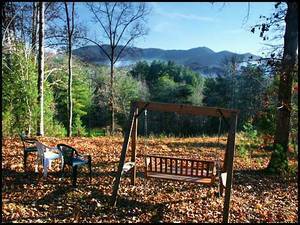 This view of the Blue Ridge Mountains is just a short walk from the cabin door on one of the many hiking trails. 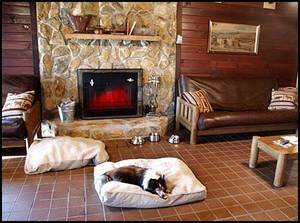 Just one of the 5 bed rooms at the Redwood Lodge with its own Fire Place. Enjoy your own campfire pit to roast marshmellows and tell all kinds of stories. Deep Creek, originating out of the Great Smoky Mountain National Park. Creek is across the street and the Park entrance is just 1 mile up the street. Rates are based on time of year and number of guests. Please call for rates and availability.